Where Did Underground Cartoonist Spain Rodriguez Get His Start? Regrettably, another one of the great innovators and truly original icons of the 60s has died. Underground cartoonist Spain Rodriguez was instrumental and influential in the rise of underground comic’s. When one reads of his childhood in Buffalo New York, you will find he (like so many of us) was engrossed with comic books. Reading, collecting, trading and trying to copy and draw all the superheroes and villains. My best guess is Spain Rodriguez started his particular revolutionary comic art style when there was a censorship of comics in the late 1950s. (He was working at EC Comics for Bill Gaines at that time). I believe his anger at the establishment never left him. Illustrating tales of revolutionaries taking back the streets violently from situations of repression and corruption. Then again, this may have started way before that. Born (Manuel Rodriguez) in Buffalo March 2, 1940, “Spain” got his name from defending his heritage in many school fights. Young Spain was a juvenile delinquent of sorts. Getting into trouble and stealing cars. I believe that the most pure and best creativity comes from extreme emotions like love, hate, anger,fear and envy. As an underground cartoonist Spain Rodriguez exorcised these feelings into a new bold, bombastic and cataclysmic art form the underground comix. 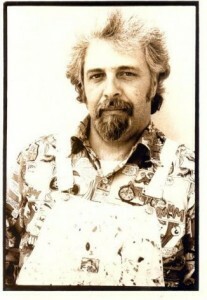 After working for Bill Gaines (Mad Magazine) it didn’t hurt to have friends like underground artist Art Spiegelman and rock stars like Jerry Garcia to help his career. He would be included in the innovator’s and wave of artists like R. Crumb, S.Clay Wilson and Bill Griffith who established the irreverent, profane, highly sexed, antiwar, anti-capitalists spirit. Things very dear to underground cartoonist Spain Rodriguez. We salute you and miss you, sir.